After a solid showing at the keyboard, John and I decided to take advantage of the lovely weather and take our time getting lunch. He grabbed his bicicleta and I my boardo. 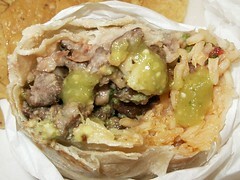 The specimen at right is a carne asada burrito, doused in hot sauce. This Benitos Taco Shop meal was rated: 6.1. Sunday, April 30, 2006 by Jonah.